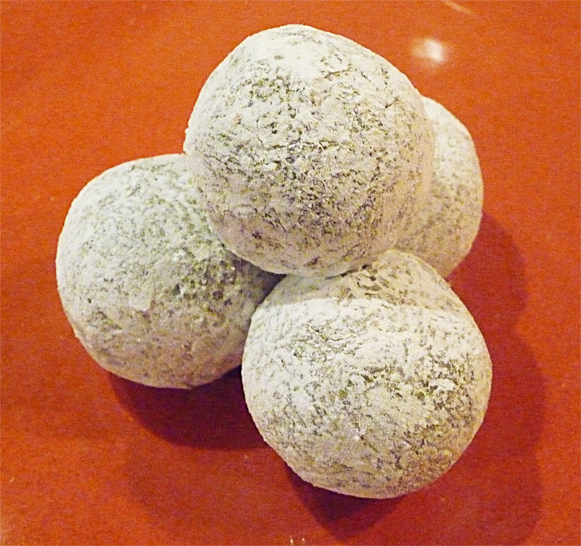 Aside from the Grinch, who celebrates the holidays without rum balls? 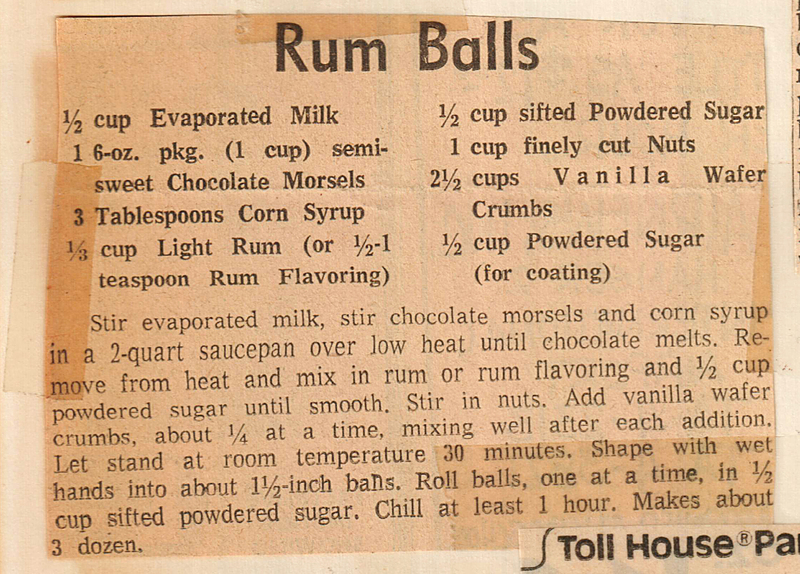 Rum balls are a nostalgic favorite. This no-bake recipe will surprise you with its super-amazing taste; a nutty, chocolatey mouth-watering sweet that tickles your tongue with the delightful dismount from a pleasing punch of rum. Yeah. Makes me want to “scarf” a dozen. 1. 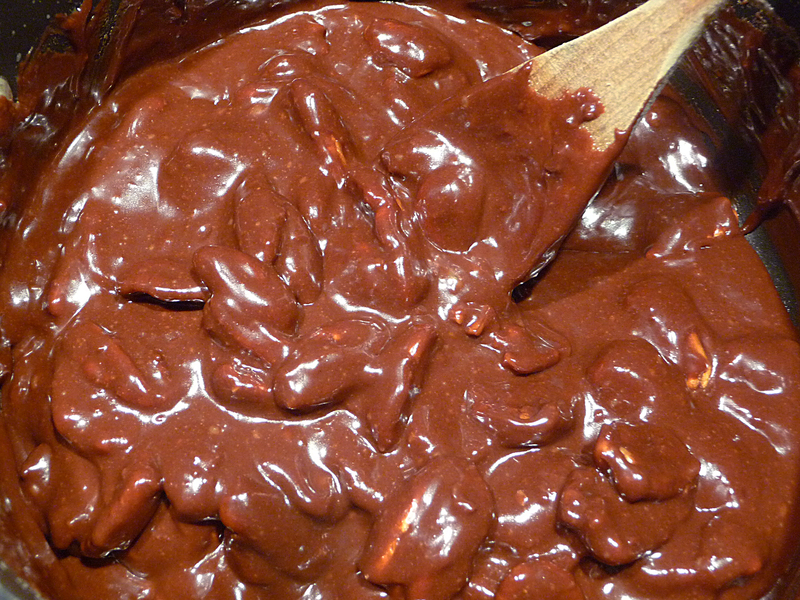 Stir evaporated milk, chocolate morsels and corn syrup in a 2-quart saucepan over low heat until the chocolate melts. 2. Remove from heat and mix in the rum and 1/2 cup powdered sugar until smooth. 3. Stir in the nuts. 4. 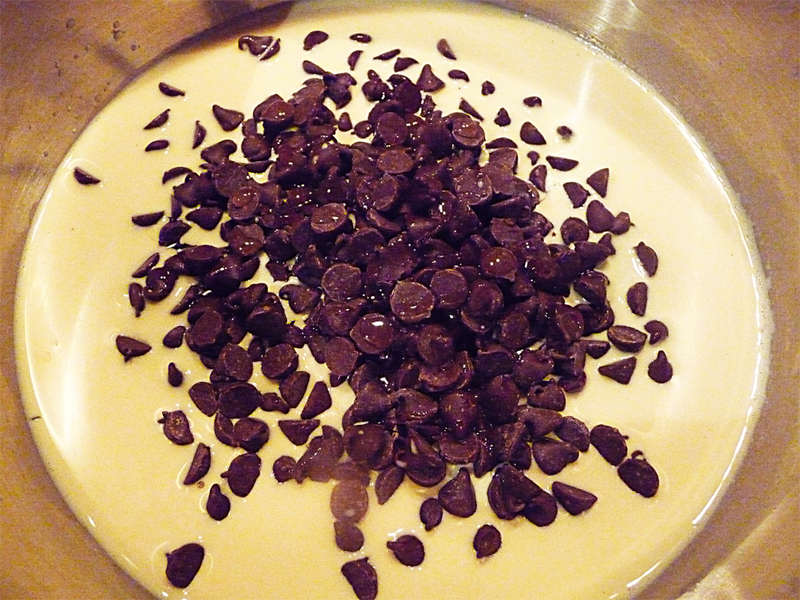 Add the vanilla wafer crumbs about ¼ at a time, mixing well after each addition. 5. Let stand at room temperature 30 minutes. 6. Shape with wet hands into 1-1/2 inch balls. 7. 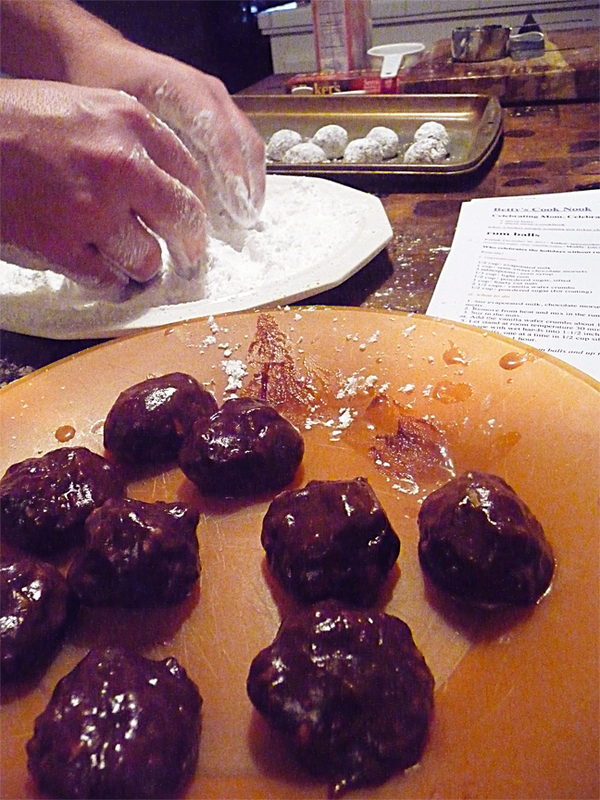 Roll balls, one at a time in 1/2 cup sifted powdered sugar. 8. Chill at least 1 hour. Yields about 3 dozen rum balls and up to 3 dozen fans, depending on how generous you are with their serving size. Enjoy these yum balls! Er, rum balls! ♥ Don’t be stingy with the rum. If you feel the need to add a bit more, I won’t tell. ♥ To make the wafer crumbs, I put the whole cookies in a ziploc bag and used a rolling pin. Don’t pulverize the wafers into powder; small chunks add texture to these tasty treats. ♥ Make sure and keep your hands wet (like the recipe calls for). I left the kitchen sink water running and wet my left hand before rolling each ball. ♥ After rolling the balls, they may be a little deformed. No worries. I popped them in the fridge for about 10 minutes and they firmed-up. Then I rolled them in the sugar and was able to get them shaped perfectly round. If they still aren’t to your liking, you can put them in the fridge to chill again, then roll and coat with more sugar. ♥ Use plenty of powdered sugar for the coating; I used 1 cup (vs. 1/2 cup). the twinkle in her eyes reminds me of mom. Lizzie and I also share the same birthday. 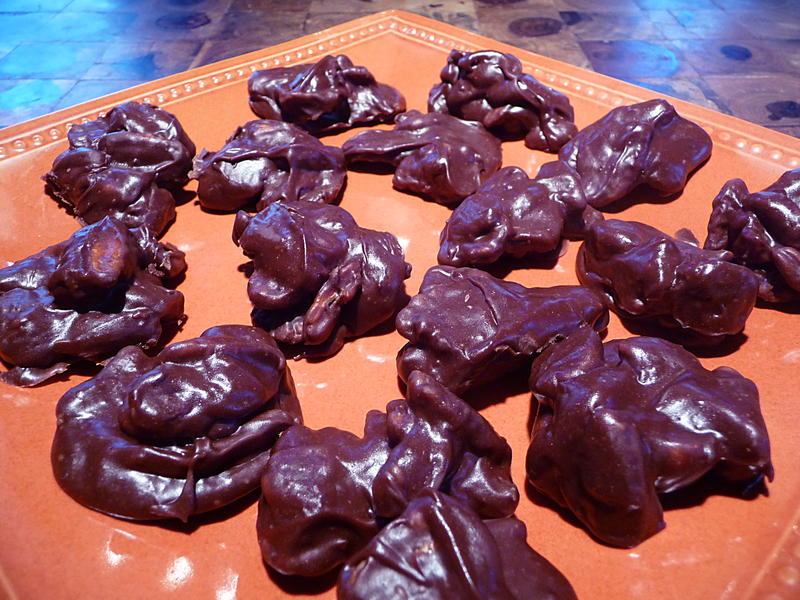 If the Texas praline had a kissing cousin, the pecan cluster would surely be it. I stumbled across this easy-to-make recipe in mom’s cookbook and since it’s fall, I thought it was the perfect time to share the toasty taste of pecans for fall foodies. Besides, who doesn’t love things made with Texas pecans? Yee HAW! 1. Mix evaporated milk, sugar and corn syrup in a 2-quart saucepan. Cook and stir over medium heat until mixture boils and is bubbly all over the top. Boil and stir 2 minutes. 2. 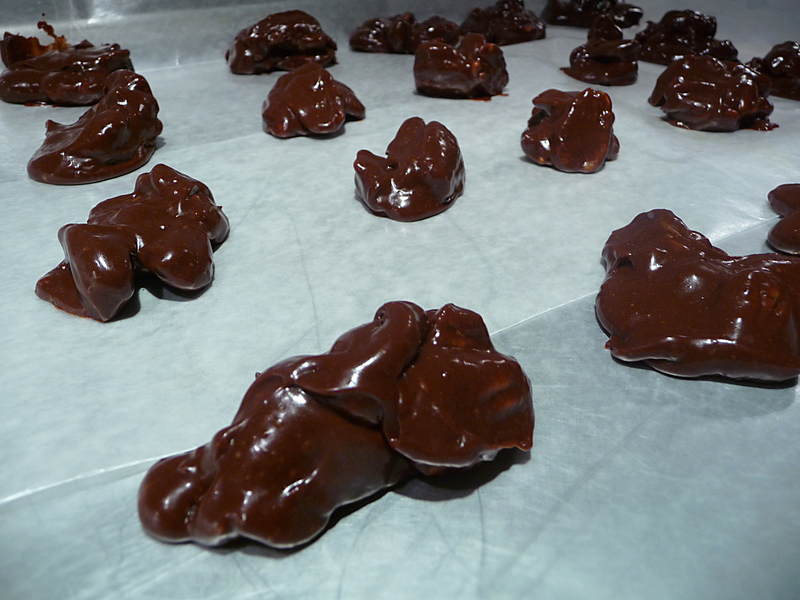 Remove from heat and stir in the chocolate morsels until the chocolate melts completely. 3. Mix in the pecans. 4. Using 2 teaspoons, drop the mixture onto waxed paper and chill until set. ♥ Lizzie’s grandmother “Lou” was a whiz in the kitchen come holiday time. She would make hundreds of sweets that she would plate-up and share with friends and family. 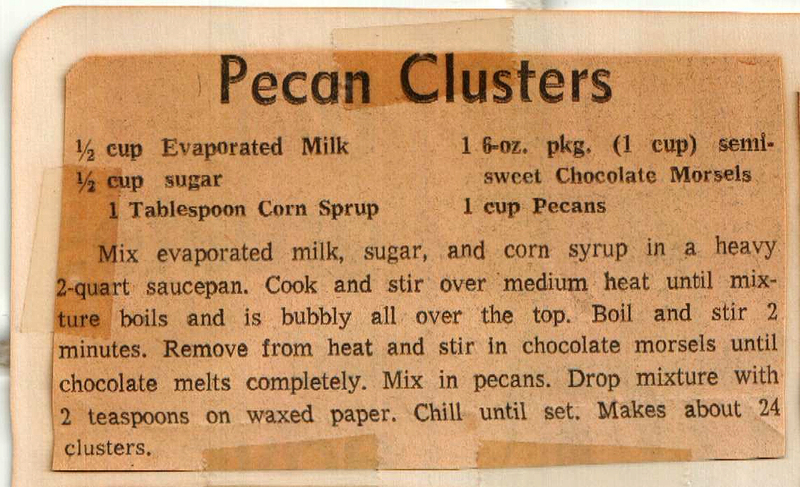 I miss those treats a lot, and this pecan cluster recipe reminds me of something Lou might have whipped-up.